Online keynotes are the future of speaking. 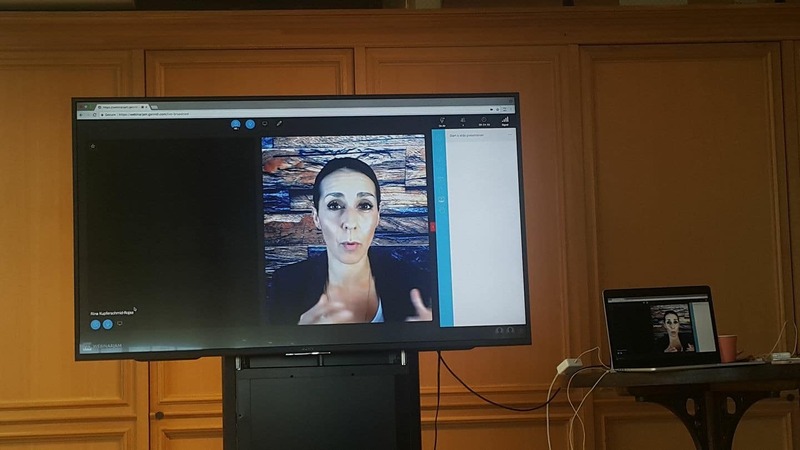 Soulaima Gourani can broadcast her keynotes and presentations to a remote audience anywhere in the world and she is full of energy and as powerful online as she is in real life. Soulaima Gourani is passionate about her online presentations and assessments of her speeches has been very positive. In addition it is a very cost efficient way to have Soulaima Gourani speak for you. For Soulaima Goruani to speak in person in Copenhagen or Berlin she will travel 15 hours from Palo Alto, California and you will need to pay her a (very) good hotel and fly her back to USA. Broadcasting her keynotes and presentations saves lot of travelling, CO2 and expenses. Interfacing with a screen is often more normal than interacting with someone face-to-face. It empowers interaction, even for the shy people. Introverted people are more apt to weigh in on a discussion when it’s a digital dialogue since they can write questions along the presentation. Broadcasting keynotes are less expensive. It allows a virtually unlimited amount of people to enrol, you can record it and share with others after the presentation. Soulaima was really great and the team was inspired! The sound and video quality were very high! I don’t have any suggestions for improvements. Inspirerende, giver stof til eftertanke, seriøst – krydret med en god gang humor. Har fået mange positive tilbagemeldinger fra publikum efterfølgende.